Description: CX2602 is in black text on cart label. 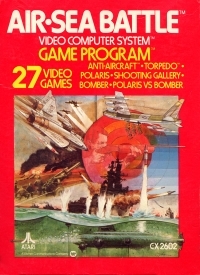 The game released in Europe was the same NTSC release, thus the colors were slightly different when playing on a PAL console. The serial code did not have an "P" at the end, as it was in fact the NTSC release. 01-07-2018 schtzngrmm Description CX2602 is in black text on cart label. The game released in Europe was the same NTSC release, thus the colors were slightly different when playing on a PAL console. The serial code did not have an "P" at the end, as it was in fact the NTSC release. 09-26-2017 tripredacus Description CX2602 is in black text on cart label. 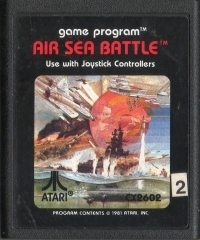 This is a list of VGCollect users who have Air-Sea Battle (black CX2602) in their Collection. This is a list of VGCollect users who have Air-Sea Battle (black CX2602) in their Sell List. This is a list of VGCollect users who have Air-Sea Battle (black CX2602) in their Wish List.